This Book will help students to understand programming and coding. It contains approximately 200 question with the solution on "e;C language"e;. 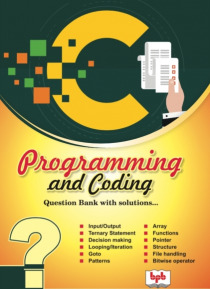 It covers all the topics of C like Input/Output, Decision Making, Iteration, Array, Function, Pointer, Structure, Union, File Handling, Dynamic memory Allocation etc. It covers all the questions which are important from the point of view of the in… terview and examinations. It will be helpful for students who wish to understand the coding skill.